The Scottish government has announced that it wants alcohol to be sold at a minimum of 45p per unit. The SNP's minimum price plan, which is contained in its Alcohol Bill, is an attempt to reduce consumption. If agreed, the change would see a two-litre bottle of Tesco brand cider go from £1.32 to £3.80, while Asda whisky would rise from £9.20 to £12.60. Opposition parties at Holyrood intend to unite to block the policy as they say it would hit responsible drinkers. But Health Secretary Nicola Sturgeon has maintained that costs would only rise for high-strength products sold at rock-bottom prices. According to the government's figures, there would be no change in the cost of brands like Bell's, Whyte & Mackay or Johnnie Walker, which all currently retail above £14. MSPs in the Scottish Parliament voted for the principles of the Alcohol (Scotland) Bill in June. 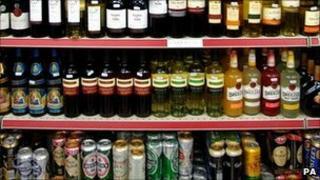 But opposition parties, who have a majority, have vowed to remove plans for minimum pricing at a later date. The bill will come before MSPs at the Stage 2 committee later in the month and ministers have decided to name the minimum 45p per unit price so that it can be included in those discussions. Nicola Sturgeon said that by introducing a minimum 45p per unit price, there would be 50 fewer deaths in the first year after the policy was implemented, a £5.5m reduction in health care costs and 1,200 fewer hospital admissions from alcohol-related conditions. She said: "Getting the price right is vital for minimum pricing to work - too low and it will simply be ineffective. "After careful consideration, we believe that 45p per unit is the right price. "Our proposals have already won backing from respected health professionals at home and abroad and I hope, for the sake of our nation's health, they will also win the backing of the Scottish Parliament." The minimum pricing move has received the backing of the British Medical Association in Scotland, the Royal College of Physicians and Alcohol Concern. But it has been criticised by some drinks companies and the Scottish Retail Consortium, as well as opposition parties at Holyrood. On Tuesday, the Scottish Labour Party's alcohol commission published its report into the alternatives to minimum pricing. It recommended a UK-wide "floor price" for alcohol, which would ban drink sales below the total cost of production, duty and VAT. The commission, which was chaired by Professor Sally Brown, called for duty rises to be the "main lever" for achieving price increases. However, the health secretary said this UK-wide approach would "pass the buck to Westminster", and Alcohol Focus Scotland said it was unworkable because of the difficulty of calculating production costs. The SNP's minimum price policy was first mooted in March 2009, but the Scottish government had, until now, failed to put a figure on how much would be charged. It had stated that it must examine all of the evidence before coming to a final decision - although 40p per unit had been suggested. Scottish Lib Dem justice spokesman Robert Brown said: "The SNP have taken a very narrow view of the whole process, totally ignoring much more effective solutions which would cover the entire UK, something which the coalition government is already considering. "They clearly prefer a pricing mechanism that stops artificially at the border." Jackie Baillie, Labour's health spokeswoman, said: "The SNP have got this one badly wrong. A minimum price of 45p per unit will make no difference to the cost of problem drinks, like Buckfast, but it will punish pensioners and people on low incomes. "According to the Scottish government's own study, a minimum price of 45p per unit will deliver over £140m of extra revenue for retailers. But it won't create a single extra penny for more police or the NHS." The Wine and Spirit Trade Association said a minimum price was wrong in principle and would punish families on low incomes and pensioners. The Scottish Grocers' Federation welcomed the proposals, saying they would stop the "irresponsible selling" of alcohol below cost by large supermarkets and help to level the playing field between small shops and bigger chains. But they warned it could create a cross-border and internet trade in drink.